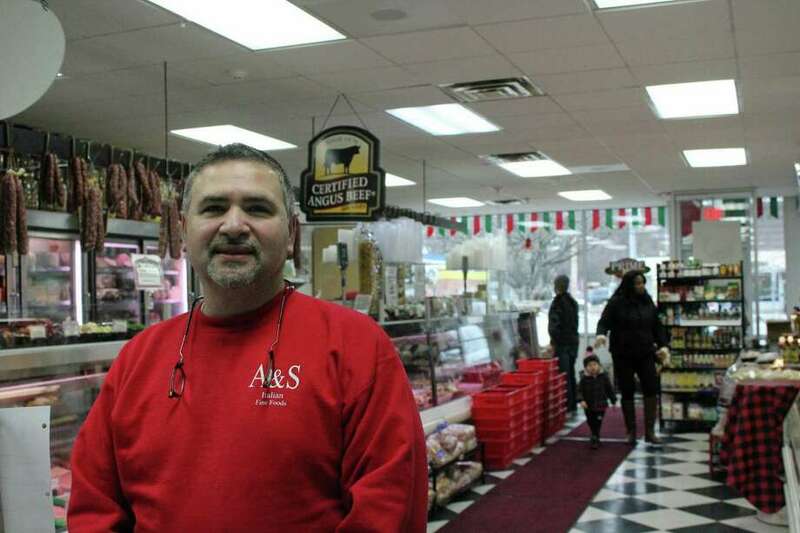 Carmine Battimelli, co-owner of A&S Italian Fine Foods. FAIRFIELD — The interior of A&S Italian Fine Foods is clean and well-lit, the black-and-white checkered floor shines. The smell of pork sausage, marinara sauce and prosciutto floats through different parts of the store. Carmine Battimelli, co-owner of the deli with his wife Doreen, remains in the back offices, where he is constantly answering the phone, arranging deliveries, answering questions and directing his more than 30 employees. “We have our own special sausage-making equipment here and for mozzarella, too,” Battimelli said in a strong, Brooklyn, N.Y., accent as he toured the kitchen. The deli is celebrating its 25th anniversary at its current location at 2079 Black Rock Turnpike. Battimelli has been in the industry ever since he was a 13-year-old growing up in Brooklyn, and recently talked about his trajectory and the changes in the deli business throughout his time. Q: How did you start out in the deli business? A: It started as an after-school thing, when I was 13 or 14 years old. There was a neighborhood market, it was a neighborhood business in Brooklyn and I liked it. I liked the food. I’m a foodie — I cooked in the kitchen with my mother and we enjoyed it. As kids she kept us busy with those kinds of chores. She would put kilograms of dough on the table with some eggs and olive oil and mashed potatoes, and we would make gnocchi. We would all roll it up. We all had a chore to do. Everything was handmade. Q: What makes you decide to start out your own place? A: Back in 1985, when I came to Connecticut, I was looking for a good Italian market, an area where they needed a deli like this. At the time in 1985 New York, Italian markets were common and all over the place. I know I wanted to go to another state, and I chose Connecticut because we had the sort of demographics we were looking for and Fairfield County fit that bill. We were in Stratford for eight years and the economy during that time declined, from 1985 to 1993. The economy got tough there and the property of this area (where we are now) said he would like to have us in our strip center, that we would be a great asset. We did a soft opening at the end of October in 1993 and held off until January. We are into our 25th year now. Q: How did you feel opening your first and second store? A: I have a lot of confidence. I enjoy what I do. At 13 years old, I started in this business and I love food, I love people. I wasn’t nervous because I feel in my element and everything else comes automatically with hard work, being honest and doing the right thing. I treat customers like my family. Q: Do you go to Italy? What things do you bring to a business that is very traditional? Of course, I go every year. I’m trying to go in July or May this year. I go for food shows and I visit factories for pasta, prosciutto and cheese. We went to the parmigiano factory — there are like 13 of these in Parma. I try to bring new things in the same category. This year there was this new salami out of Parma. I have an idea for the American market and the palate, and I see stuff in Italy that I know it’s going to do well here. Q: What trends do you see for the upcoming year? A: We do move along with the changes like with younger people who have different habits and what their needs are. I notice a lot of younger people today who come in from work from the city. We’ve adjusted to them, and another thing we’re adjusting to now is how the younger generation orders via their iPhones. We’ve been getting involved with Uber Eats and we’re going to try to come up with our type of delivery. We’re trying to meet demands and that’s important.